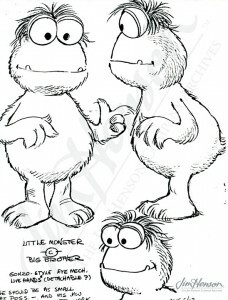 Little Muppet Monsters was developed in 1985 as a result of the stunning success of the animated show, Muppet Babies. Jim Henson and Michael Frith, executive producer of Muppet Babies, came up with an idea for a show featuring young Muppet monster characters that would also give the Classic Muppets (by then finished with The Muppet Show) a chance to appear occasionally. 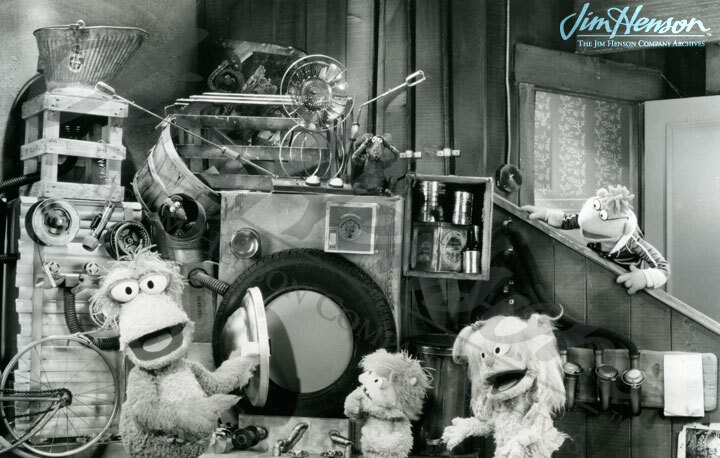 They sought ways to extend the Henson presence on Saturday morning television and wanted to complement the themes of imagination and creativity in Muppet Babies with a second half-hour, making an hour of programming under the banner Jim Henson’s Muppets, Babies and Monsters. The basic premise of Little Muppet Monsters was that three monster kids, Molly, Tug, and Boo, went down to the cellar of the Muppet Mansion and discovered a whole new world of theatrical props and costumes from the days when their elders starred in The Muppet Show. The kids decided to create their own television show which unbeknownst to them got broadcast upstairs to the grown-up Muppets’ TV set. The bits featuring the puppets were interspersed with animated and filmed sequences produced with Marvel (the co-producers Muppet Babies). 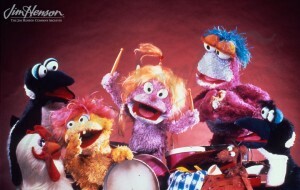 With new characters, Little Muppet Monsters was a chance to highlight some of the younger puppeteers’ performing skills. Led by Richard Hunt playing Tug, Camille Bonora and David Rudman played Molly and Boo. 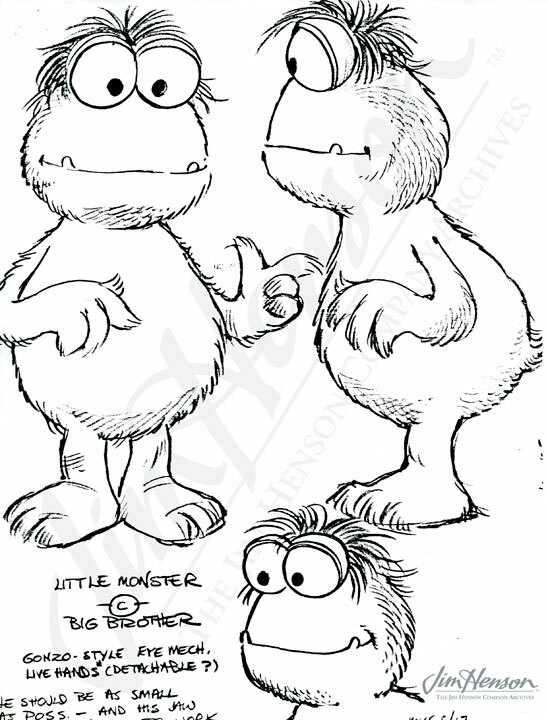 Thirteen episodes of Little Muppet Monsters were written, but not all of the elements for each episode were produced. The first episode premiered on CBS on September 14, 1985 with Muppet Babies. After just one more week, the show was cancelled, and CBS aired back-to-back Muppet Babies episodes instead in the 9:30 time slot for the rest of the season. 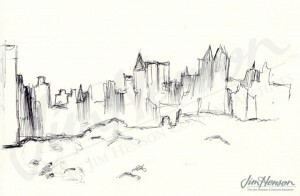 Around the same time, Jim added to his eclectic collection of art and crafts by purchasing an ancient falcon statue from the London-based Rabi Gallery. Jim’s apartment, high in the Sherry-Netherland Hotel overlooking Central Park, boasted an array of hand-made objects and furniture, many with animal themes, that made for an visually arresting space with a focus on beauty and the act of creation. Michael Frith’s design for Tug from Little Muppet Monsters, 1985. Boo, Tug, Molly, some penguins and a chicken in Little Muppet Monsters, 1985. Characters on the set of Little Muppet Monsters, 1985. 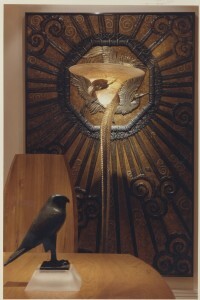 Jim’s falcon statue in his Sherry-Netherland apartment, late 1980s. Photo by Thomas Hooper. 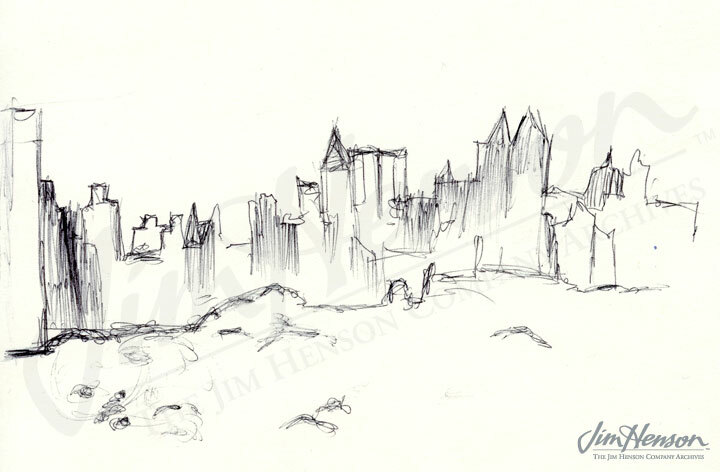 Jim’s sketch of the view across Central Park from his Sherry-Netherland apartment, late 1980s. This entry was posted in 06-June '85, 1985, Muppet Babies and tagged Boo, Camille Bonora, David Rudman, Little Muppet Monsters, Michael Frith, Molly, New York, Richard Hunt, Tug. Bookmark the permalink.